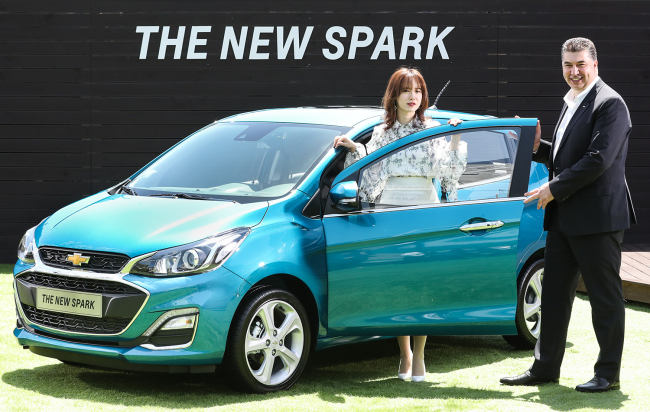 Putting the issues of the past behind, GM Korea said it was opening “a new chapter” by launching a refreshed and also slightly cheaper mini car Spark in Seoul on Wednesday. Kaher Kazem, CEO of GM Korea said that the company will launch 15 new or renovated models in the next five years as part of a comprehensive Chevrolet strategy. Starting with Spark, the company plans to unveil its compact SUV Equinox at the upcoming Busan Motor Show and will bring more models produced overseas to Korea to satisfy the customers’ diverse expectation. “Chevrolet is a global brand. We have a very diverse portfolio (in the brand). We will make sure that customers in Korea will have access to Chevy models brought from around the world,” the CEO said at the unveiling of the new Spark in Seongsu-dong, formerly an industrial village, in northwestern Seoul. Under the theme of “lean muscularity,” the New Spark has embodied the concept of “modernism” and “aggressiveness” while keeping the heritage of Tico, a mini car by Daewoo Motor, predecessor of GM Korea. Adopting new grille, alloy wheel and LED head lamps with chrome garnish, GM Korea has attempted to add sporty, yet refined image. Strengthening its safety feature, the company has added low-speed collision mitigation braking system that prevents collision with vehicles ahead at the speed of under 60 kilometers per hour. In a major change in its marketing, GM Korea will pursue an aggressive pricing policy “to retain customers’ confidence in Chevrolet brand,“ said Dale Sullivan, vice president of sales and marketing. He declined to comment how much the carmaker wishes to sell the mini car. Price of the New Spark starts from 9.79 million won ($9,000), down 200,000 won from that of its predecessor, to 14.7 million won, he said. To promote the brand value, the company also hired Korean actress Koo Hye-sun as a lead model for the mini car, while seeking to expand its communication channel to social networking sphere in order to reach young customers. The new Spark, manufactured in the company’s Changwon plant, will hit the market next month, for domestic and global markets, he added. Spark is sold in 48 markets around the world and is the best-selling mini car in the United States, with sales of 176,627 units between 2012 and 2017. The unveiling of the mini car came after GM reached a binding agreement early this month with the state-run Korea Development Bank, the second-largest shareholder in GM Korea. GM vowed to invest 6.9 trillion won while the KDB injecting 810 billion won to keep GM’s operation here. The agreement also bans the US carmaker from selling any of its stake in GM Korea before 2023. GM Korea closed one of its four plants as part of its restructuring efforts.